What is the difference between fitted and flat bed sheets? A fitted sheet is a sheet that is sewn with elastic, either on all four corners or on all four or two sides (like a shower cap design). The main purpose of a fitted sheet is to cover the mattress and so it is referred as a bottom sheet or contour sheet. It gives a smooth and soft sleeping surface to the sleeper. The elastic, firm corners or sides of a fitted sheet ensure a tight fitting so that it doesn’t slip when the bed is in use. What is flat bed sheet? A flat sheet is simply a rectangular piece of cloth that is also called top sheet as it is placed over the fitted sheet and comes between the person sleeping and the blanket on the top. 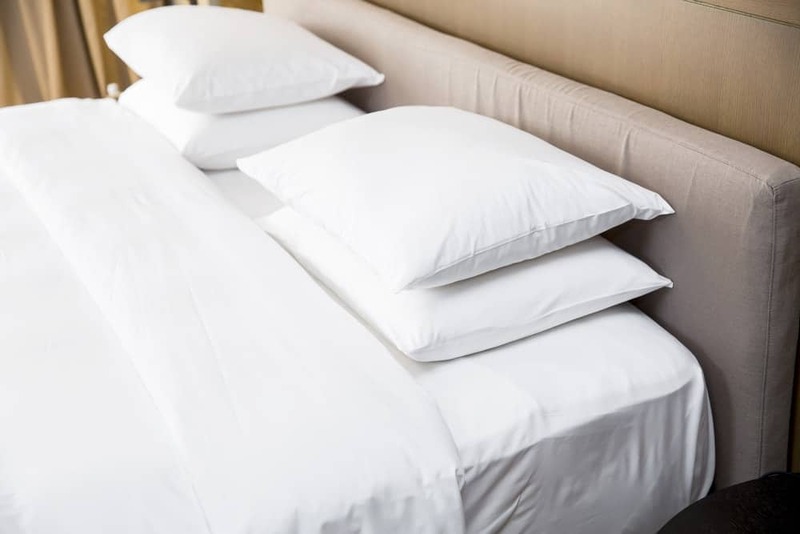 The main purpose of a flat sheet is to keep the person warm and to protect the blanket from getting dirty so it doesn’t need to be washed frequently. This sheet makes the bed linen welcoming. On the warmer nights, the flat sheets can be used by the sleeping person instead of blankets. Normally, the edges of a flat bed sheet are overlocked (a kind of stitch) to make the four seams (a joining where two or more layers of fabric or other materials stitch), sometimes the sides don’t have any seams and they just simply stitched without any finishing work. One of the four seams is wider so that it helps to correctly adjust the sheet on the mattress. The wider seam places on the head side of the bed. While manufacturing the flat bed sheets, one side is printed or patterned and this side is placed in a way to face down showing the design. What are the main differences between fitted and flat bed sheets? Flat sheets have elastic bands around their edges. They can be easily and neatly folded. They don’t lie flat and harder to fold unless they pulled off the mattress. They come over the fitted sheets. A fitted sheet is also called as “bottom sheet”. A flat sheet is also called as “top sheet”. The elastic of fitted sheets hold them snugly over the mattress. Flat sheets come between the sleeper and the blanket. Their main function is to protect the mattress and to provide smooth, soft surface to the sleeping person for lying on. Their main function is to make the bedding welcoming and to protect the blanket. What to consider while choosing flat and fitted bed sheets? For fitted sheets, the most important thing to consider while buying them is to know the exact dimensions of the mattress that includes the length, width, and thickness of the mattress. A fitted sheet must be placed snugly over the mattress so that it couldn’t be easily pulled off. That is the reason every fitted sheet is made in accordance with certain dimensions so that it fits properly. Buying a wrong sized fitted sheet will cause inconvenience when the sheet doesn’t place properly around the corners of a mattress and not stay in its place. On the other hand, considering the size of a flat sheet is less significant because it is used separately, for example, a queen size flat sheet can be used on a double bed. 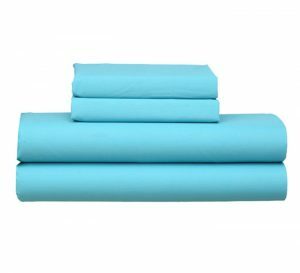 Although bedding set usually consists of flat and fitted bed sheets with two pillowcases sometimes it is recommended to buy flat and fitted sheet separately because fitted sheet needs to place much earlier than the flat sheet. The bed sheet sets at Amsons Design are the high-quality and best value as they are available in a set of a flat sheet, a fitted sheet, and pillowcases. 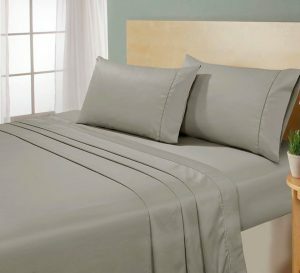 You can also buy flat sheet sets and fitted sheet sets separately with pillowcases. No matter what you like, you can make your bedding in both ways as per your choice and decide what to buy.